UNISON understands how important a fair pay deal is to you, which is why we continue to fight to increase the pay offer that Cornerstone has made. Today we’ve been looking at the impact of the backdate of the Scottish Living Wage (SLW) £8.75 hourly rate for sleepovers. We’ve calculated, using the following average values, that our members are potentially losing out on £168.15 per month. Obviously your own individual calculation will vary, but using these numbers, our members will lose £1,008.90 if Cornerstone backdate the SLW rate to 1 October 2018, rather than to the standard 1 April 2018. This is a shocking attack on low paid workers income and was a big part of why UNISON members rejected Cornerstone’s pay offer. 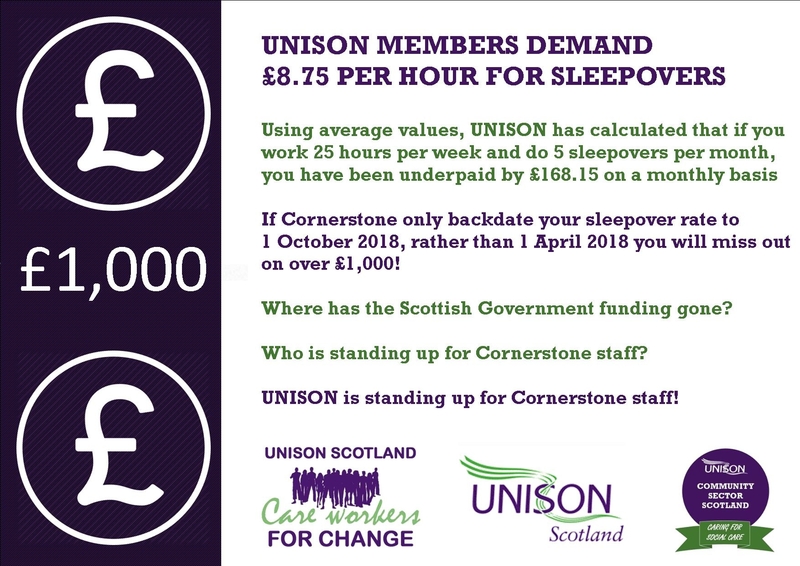 Clearly, Cornerstone staff need to join UNISON now and help us to fight for fair pay for you all. There is power in a union, that’s why Cornerstone has derecognised us!